The DVD is region free (0) and in PAL format. The price is £10.00 plus £3.00 shipping. This was a nice surprise! Didn’t think any of the shows had been filmed. Received it today so looking forward to watching it over the weekend. Thanks Mark! Is there any plans to release this on Audio CD as well??? I am surely not alone in that I don’t have time to relax and watch the DVD as often as I would like, most of my music listening is done in the car whilst travelling to and from work. I was wondering if you are going to make a United States tour? I have always listened to your music since the 1990’s and consider your band as fantastic. Would pay good money to see you guys perform in Cleveland, Ohio. Damn right we’re lucky – following a band since I was 14 years old, who still amaze me at gigs 35 years later! Went to see you boys at the Manchester Opera House on the tour. It was FAB. Having seen the “42” 10 times over the years, I am happy that the tours continue. Wouldn’t mind some new songs though! The “Summer House” is waiting. …….. 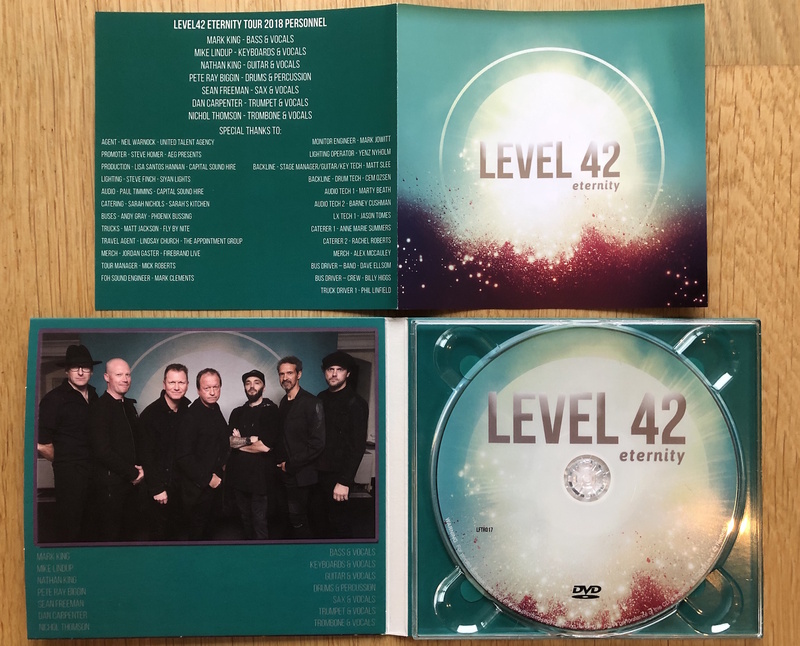 Received long eagerly awaited DVD today and sadly had Love Games missing from the set list which was also performed at Southend Pavilion when I saw them back in October. Crying shame but appreciate they can only capture what is recorded on the night. Guess you could also look at it in that we were lucky to have this in the set the night I saw them. Haven’t watched it yet but know it’s going to be shear bliss. First saw the band in December 1986. Saw this latest tour at Manchester and York, really enjoyed it, suprised how good the guys still are live, real treat to hear Heathrow, never been keen on the singles, am a true Level 42 fan, you all know what I mean. I hope you guys do a few more tours around the UK, would love to hear Wings Of Love (better bass line than Billy Jean), Pursuit Of Accidents, Almost There, 88 etc. One of the best bands of all time!! !